HSF Artist Services is an Australian built music company, founded in 2012 by Tom Inglis. With experience in the music industry ranging from record company sales, promotion, publicity and marketing to now include artist and event management. Our services have been part of success stories for a number of artists, and labels including Universal Music Australia, EMI Music Australia, ABC Music Australia, Lost Highway Australia, BMG Australia, Cooking Vinyl, Kobalt Music, Ambition Entertainment, Big Loud, Toyota Star Maker, Caroline Music Australia, Kaylens Rain, Melanie Dyer, Brad Butcher, Melody Moko, Brad Cox, Kaylee Bell, Cassidy Rae Gaiter, Juliet Oliver, Jessica Emily Odgers, Matt James, Jade Holland, Blake O'Connor, Bryce Sainty, Keely Johnson and Sophia Chesworth. 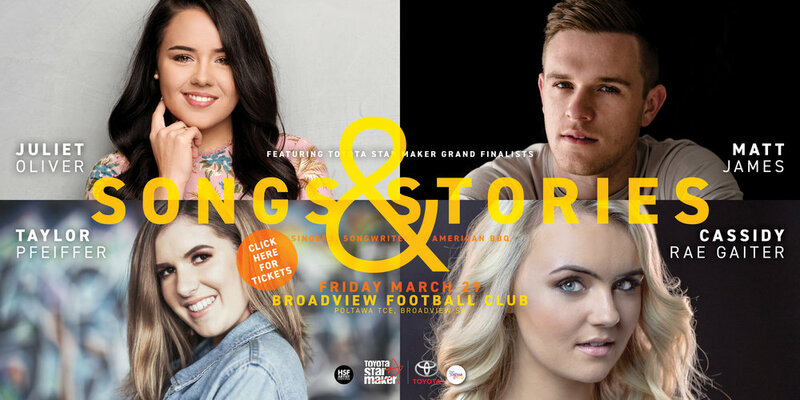 Join us to see four of Adelaide’s best emerging young contemporary country music artists. Juliet Oliver, Matt James, Taylor Pfeiffer and Cassidy Rae Gaiter will showcase their own individual brand of country music and their song writing. Inspired by the some of the hottest Amercian singers and songwriters, the evening will run like a Nashville Songwriter Round with all artists on stage together sharing their songs in a family friendly environment. Bar available and pork & beef brisket with slaw tacos available for $10. HSF Artist Services gives independent artists a way to deliver their music to the market place, while maintaining possession of their recordings. We guide artists on a pathway forward and execute a strategy that increases prominence above the humbug in today’s media space. At record labels, those appointed to marketing specific artists are Label, Project or Product Managers. Project Managers create and implement the plan for the artists and ensure that the sales and promotion team have all the information and tools to carry out their jobs for the greatest effectiveness. HSF Artist Services acts as a your Label Manager. Like a wedding planner, recognising and endorsing the most efficient and cost-effective business partners are engaged however safeguarding the artist’s creative pathway. HSF Artist Services assists artists in expressing their dreams and making them realise it, priding our originality, honesty and credibility in both us and our artists. We love building careers and have expertise and relationships with label management, artist development, retail sales, touring, digital sales, marketing, festivals, publicity, radio promotion and more. At HSF Artist Services, we are passionate about country music, that's why we specialise in combined media PR. We offer radio servicing, monitoring and plugging promotional services to Record Companies, Independent Labels or Signed & Unsigned Artists who need a knowledgeable connected partner to push their music to Australian country radio and TV. We service artists' music to all country music radio and television stations across Australia, delivering artists with value radio and television promotions along with interviews to ensure artists get the best coverage for their music. HSF Artist Services can get your music to media via a number of promotional music distribution services including those used by all major record labels and thousands of independents in more than 45 countries. We use an industry standard monitoring service used by all major record labels and label services, we deliver intelligence direct to artists about their music from local app radio to +DAB and major terrestrial radio. HSF Artist Services work closely with The Joshua Group, offering a dynamic solution to promote artists to the desired target market in the most cutting edge way. HSF Artist Services & The Joshua Group work together and tailor strategies to the promotional benefit of artists across strategic social media platforms, promoting artists direct to their fans across social media.